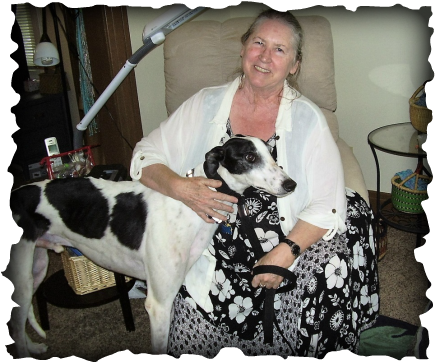 Kathy of Dayton knew she wanted a greyhound and was searching for an adoption group. It turns out she's in a knitting group with a good friend of a GAGC member so the connection was made. CH Captaintaneal, or Captain for short, is a gentle spirit and bonded very quickly with his new mom. He also figured out steps in no time at all, explored his new yard, met the neighbors, went for a walk, and had a great first evening. We hope to see this pair at lots of GAGC events.